The Gulf coast of Florida has beaches unlike anywhere else in the world. Located between Sanibel Island and Fort Myers Beach, our vacation rentals in Sanibel Harbour, Florida are the ideal location for quick access to the warm waters of the Gulf. With 7 beautiful public beaches in the Fort Myers-Sanibel area to choose from you’ll find there is no shortage of fun activities in the Florida sun! Located only a few miles from Sanibel, Fort Myers/Estero Beach offers a scenic, exciting atmosphere filled with miles of beach-lined shops, restaurants, sand, beach volleyball, water sports and more! Walk into beach-side restaurants in your bathing suit! There are multiple public access and parking areas along the island. Public Gulfside beach located mid-island on Algiers Lane off Casa Ybel Rd. offering picnic and BBQ areas with restroom/shower amenities. Beautiful public beach and fishing pier located on the eastern tip of Sanibel Island. Walk the beach as it wraps around to the water’s bay side, where the fishing pier is located and a boardwalk nature trail is available to explore native wetlands. Home of the historic functioning Sanibel Lighthouse. Turn left on Periwinkle Way from Causeway Road. As soon as you drive over the Sanibel causeway, you’ll see several mini-beaches along the way, on the left and right sides of the road. Pull over right to the water`s edge at any one of these areas, which are great for swimming, fishing, wind-surfing and picnicking. There is no fee when you park on the causeway beaches. Restrooms are available. Public beach located at the south end of Tarpon Bay Rd. at West Gulf Drive. Mid Island. Easy pay parking for recreational vehicles, picnic areas and restroom/shower amenities. Turner Beach (locally known as Blind Pass) is a public beach located on Sanibel-Captiva Rd. at Blind Pass Bridge. Popular with shellers and fishermen. Signs warn against swimming due to swift currents along the picturesque rock jetty. 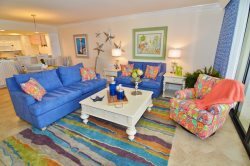 Convenient pay parking near and restroom/shower amenities available on the Captiva Island side. Secluded public beach located at the end of Captiva Dr. A beautiful place to watch the sunset, shell and sunbathe! White sand beach with breathtaking clear blue water. No restrooms and pay parking is limited.